There was a Chinese restaurant in Madison that had this pepper chicken that I loved. It was spicy and I loved that the chicken wasn’t fried. I haven’t had luck finding a comparable pepper chicken in Appleton, WI. So, I decided to make my own. It turned out pretty darn well and I know for a fact that I will never pay a restaurant to make this for me. I loved that I could make it as (not) greasy and spicy as I wanted. Marinate chicken in soy sauce for 15 minutes. Heat up oil in large non-stick pan over medium-high heat. Add onions and cook until aromatic. Add green bell pepper and jalapeño. Cook for 2 minutes and add in chicken strips with soy sauce. 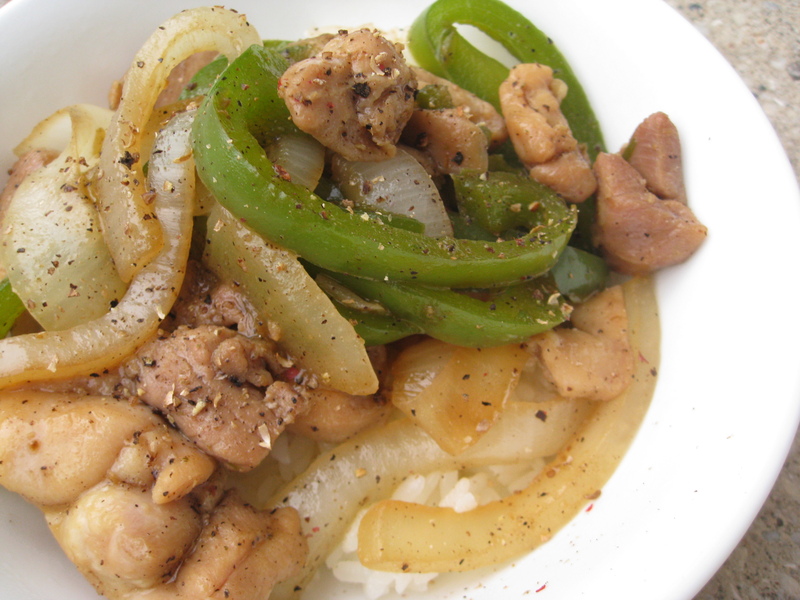 Season liberally with black and white pepper, until desired level of spiciness is reached. * Cook until chicken is cooked through. Categories: Chicken, Dairy Free, Gluten Free, Main Entrees, Meat, Special Diets | Tags: Asian, chicken, main dish, meat, onion, vegetables | Permalink. yummm!! this looks delish! what restaurant in madison did you get the pepper chicken at? Hey Lexee, the restaurant is Nam’s Noodles on Regent St. Check it out!